Assuming that no major illness exists that would require a doctor's release before exercising, start low and go slow. Be aware that your prior physical status will dictate what kind of program you should follow. Throughout the web site, you'll find recommendations regarding modified exercises that could apply to you. We recommend a program with three days of exercise a week as the bare minimum. Less than that and you become more prone to injuries. It is not uncommon to experience pain and soreness during the initial days of a fitness program. At a microscopic level, the increase in strength and stamina obtained from a workout occurs when the muscle cells repair and rebuild themselves after being strained and damaged by exercises. The local release of chemicals by the muscle aids in its repair, but it takes several hours after completing a particular exercise for the production and release of these agents. These chemicals not only help in the healing process but also cause temporary pain and inflammation; therefore, one does not usually develop aching muscles and joints until a day later. Remember this before deciding on a sudden, sizeable increase in your routine of exercises just because you're having a good day. 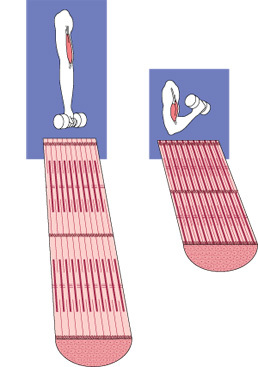 The "no pain, no gain" maxim should be followed with caution since a certain burning feeling and pain in the muscles is to be expected if they are to become stronger, while pain in the joints and tendons could indicate a more serious problem due to damage and chronic inflammation. It seems that the difference between good pain and bad pain lies principally in the ability of the tissues to heal: tendons and joints heal very slowly and therefore they are more apt to suffer from new injuries before the old ones are cured. After reading the previous chapters one can better understand why the body's capacity for healing decreases with age, but science can only partially explain why children have such an enormous ability for quick healing, while older people do not. Injuries to both young and old exercisers can be avoided simply by using good sense, pacing, and sticking to a routine until one feels strong enough to add to it. Becoming impatient with what seems to be too slow a progress is a sure path to injury. Any injury should be followed by a few days resting the affected area either by discontinuing the workout routine completely or by modifying it enough to allow healing to occur. A common mistake injured exercisers make is to try to catch-up with lost time by quickly resuming a full program, erroneously assuming that once the pain improves, the injury itself should be cured. This often leads to a pattern of recurring injuries, interrupted by a few days of partial rest and resulting in chronic painful conditions, such as tendonitis and arthritis. A great way to stay fit during recovery is to exercise in a swimming pool, not only for the buoyancy that unloads the weight from the joints, but also for the resistance imposed by the water which does not allow for sudden movements of a painful limb. If an injured lower extremity is swollen, great benefit may result from walking inside the pool because the weight and pressure of the water increase with depth, being maximal at the feet and minimal at the surface, resulting in a natural, painless, graduated compression of the legs that eventually pushes the fluid from a swollen leg back to the circulatory system.